Exe Valley Fishery … like you have never seen it before! The sun is out at last, and we hope you have been able to dust down the rods and go fishing. Have you visited Exe Valley Fishery recently? If not here is short a reminder of the spectacular scenery and fishing to be experienced at our beautiful Somerset location captured superbly on film by Blair Woodland. However, if you are now gagging to dash down this Saturday 21st April 18 (please come on Sunday 22nd instead!) because the site will be closed for the day as we are hosting a private event. We apologise for any inconvenience this may cause. Meanwhile if there are any budding young anglers out there please give Fred Leach a call who is hosting a Youth Fly Fishing Day on Saturday 20th May 2018 at Exe Valley Fishery. There will be a group of qualified instructors on hand teaching the basics of fly casting and fishing for Trout. 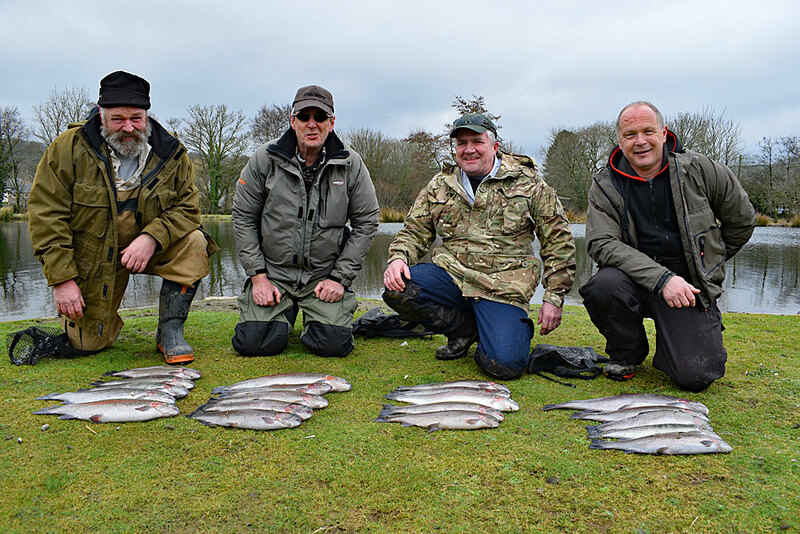 In previous years this successful event has produced Trout of up to 6lbs for the children, with many discovering a new passion for the outdoors and fishing. Please call Fred on 01398 331019 for further details. Until next time, thanks for reading and enjoy your fishing! The Beast from the East seems to have retreated and just hopefully spring is around the corner as it has been a looooong winter! If you have had enough of it all why not head out West and wet a line, one thing is for sure the water is cold, full of oxygen and the Trout just love it. Our anglers are making use of the Catch & Release tickets which will be held at the price of £25 for a 10 fish limit this season, with all other ticket options also held as per the 2017 rates. 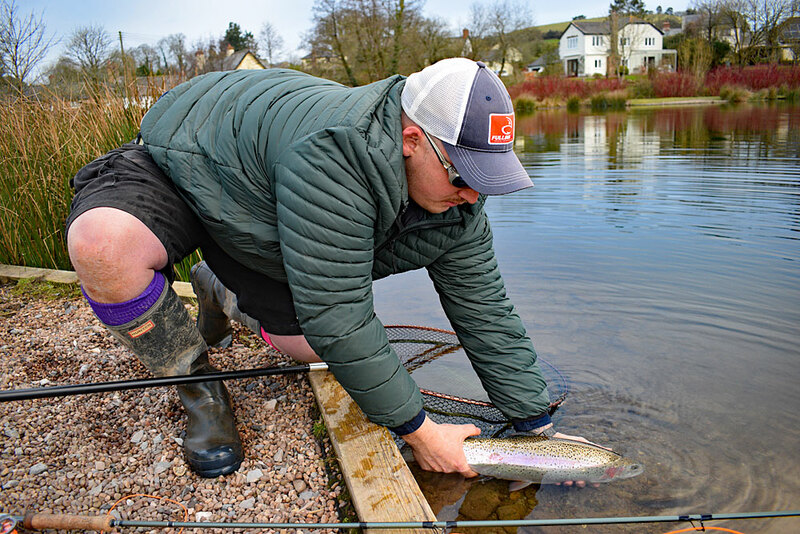 Blair Woodland makes use of the higher temps to enjoy a Catch & Release session at Exe Valley. Reading from the returns archives Mr Tomkins recently tried a sporting ticket and worked nymphs for 4 fish over a few hours before switching to a stripped Blob which gave him another 5 fish in just half an hour. Other returns mention the depth of the fish with the word “deep” used consistently along with “cold” including Mr Hobdens comment which made us chuckle “Bloody Freezing!! But good sport!” There is no doubt that wrapping up warm is required to enjoy a day at Exe Valley but if you put in the effort the chances are you will be rewarded with some action. John will hope for an equally impressive bag in just over a weeks’ time when on Sunday 18th March Exe Valley will host its annual Troutmasters Fish Off to determine who will head to the final later in the year. This event is already well signed up with around 15 anglers attending but if you have an invite and have yet to contact us, there is still time, if you are quick! Please note that the fishery will be closed to regular day tickets on 18/03/18 until after the match which is due to end around 2pm. If you are going to practice beforehand or if you are just heading to the fishery for a pleasure day it would be well worth packing Blobs, Snakes, Blue Flash Damsels, Apps Worms and a few buzzers. Floating lines with long leaders (fished slow) will work well but in recent weeks intermediates and medium sinkers such as the Di-3 have been well worth trying. And to round up this catch report please note that Lobbs Lake will be open by the end of the month (in time for Easter) with further details regarding the fishing that will be available on this venue posted next time. Many thanks for reading and look our for more news soon.